Bartons On Board! : The Man's Meat Paleo Pizza Crust! The Man's Meat Paleo Pizza Crust! 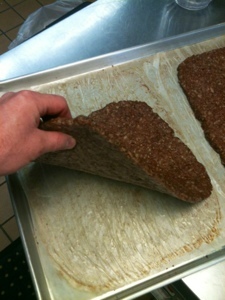 But seriously it can be for women too if they like this much meat! 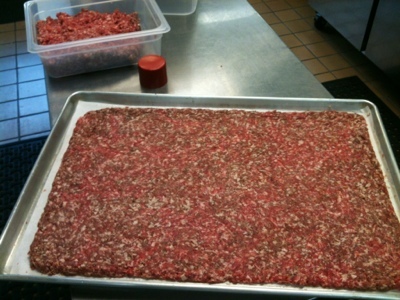 I suggest using ground pork of some form, whether it be Italian sausage, breakfast sausage, or just ground pork. I suppose hamburger may work but sometimes it doesn't seem to be as cohesive as pork. 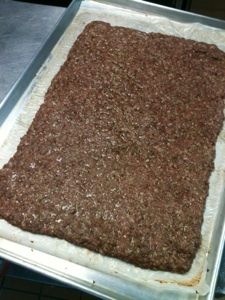 Flatten ground pork down with hand or parchment paper and rolling pin. I would suggest a half inch thickness, some will melt away. Make sure you at least have parchment paper, silpat, or something nonstick underneath. 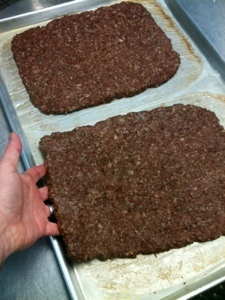 Bake the meat in a sheet tray or pan. My meat crust was baked in 350 degree (F) oven for about 15 minutes. You need to make sure and use a sheet tray or pan to catch the grease and juice that will cook out so you can drain it off. And just like the cauliflower crust in my previous post, you would then top it with sauce, cheese, and whatever else you desire! Then put back in oven till the toppings are done or cheese is melted. This should easily be Paleo, Keto, and Atkins friendly! LOL!